Minnesota summers are so short that they often fly by in the blink of an eye. To make the most of the gorgeous weekend we just had, I found a bunch of active things to do. On Friday we went to the gym, Saturday consisted of Disc Golf and Sunday sent us to one of the local lakes to go paddle boarding. I’ll admit that I’m more than a little tired, but it felt good to be so active. The same logic can be applied to exercising your digital marketing muscles. The first couple days you might be “sore” but once you get into a routine, it’s easy sailing. The digital marketing landscape changes so quickly that the tactics that your team is deploying currently, may be vastly different in the matter of a few months. 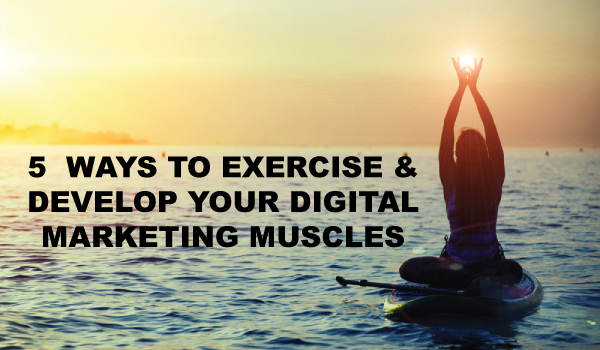 Below are some simple exercises to keep your digital marketing muscles toned and ready for an active workweek. To start, it’s important to get into a routine and start exercising a little every day. With how quickly digital marketing is evolving, working ongoing education into your routine is a must. In order to keep up (or get ahead), it’s important that you’re paying attention to the smart work created by other marketers in your field. Each day I make it a goal to read at least 2-3 blog posts from other marketers. Sometimes I need inspiration when I’m stuck writing a blog post, or maybe I’m just looking to see what tips these marketers have up their sleeve, either way, there are many benefits. This weekend was only my second time venturing out on the lake to paddle board. I will admit, the first time was a little nerve wracking. But this time, I glided across the lake with supreme confidence and grace (or so I’d like to think). If I hadn’t taken the chance to try something new, I would have been missing out. The same rule applies to your digital marketing knowledge. A recent study found that 86% of buyers were looking for access to visual/interactive content on demand. Perhaps you have grand aspirations to have a video series, but just can’t seem to sit down in front of the camera and start shooting. Or maybe you’d like to try your hand at creating a new type of visual content. Take the first step and give it your best shot. True, what you create may never see the light of day, but at least you took a step towards testing to see what does (and does not) work. It’s much easier to get into an exercise routine if you have someone else to help push you, keep you honest and workout right alongside you. When you’re training for that digital marketing marathon, you’ll want to make sure that you have other smarties by your side. You can either partner up with people you work with, or other digital marketers you know outside of work. One way to keep everyone on track is to plan on meeting regularly (either virtually or in-person) to transfer knowledge. Another idea is to have a monthly book club revolving around digital marketing books and discuss what you learned. Maybe your exercise goal is to get toned, lose a couple inches or be able to bench 25% more than you can now. Either, way – it’s important to work towards something. Think about your digital marketing goals in the same light. What do you want to learn, execute and measure by a specific date? Determining what your goals are early on can be incredibly helpful in sticking to your routine. For example, if you want to add co-created influencer content marketing to your program deliverables, create a plan to find out what steps need to be taken, and how you’ll “train” to get there. Learning how to add new marketing skills to your arsenal takes time and dedication. Some weeks you’ll se a lot of progress in your increased knowledge and application, while other weeks will be a bit slower. The harder you train the more knowledge you will gain. There is virtually no limit to what you can do to educate yourself on an ongoing basis. It’s all up to you. What have you found to be the best way to work ongoing digital marketing education and training into your routine? Great list of resources, and I like the way you relate it all to a fitness regimen. I often find myself swinging in and out of marketing things. I’ll get deep into it, but then it’s the first thing to go when the workload ramps up. I’ve found it’s easier if I actually force myself not to spend as much time on it when I’m in the mood, to avoid burn out. Balance, balance, balance.